The Best Family Locations | Destination M.O. Family holidays are great in theory—spending time together, creating memories that will last a lifetime, experiencing a destination through a child's eyes—but, in reality, travelling with young children can sometimes leave you feeling as if you need a holiday to recover from your holiday. Which is why Mandarin Oriental has made a concerted effort to entertain Young Fans, so that their Very Important Parents get to relax and enjoy their break, too. With a whole host of amenities, programmes and services geared toward young travellers, Mandarin Oriental believes that happy children make happy families, which in turn make for very happy holidays, and who can argue with that? Shaolin kung fu with Master Hu at Mandarin Oriental, Sanya. The recipe for a great family holiday starts at the beginning, and, from the moment young travelers enter a Mandarin Oriental hotel, they are made to feel special with welcome gifts and child-friendly amenities in their rooms. 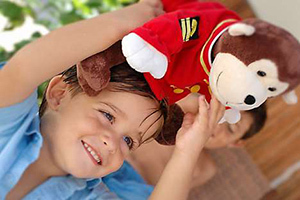 At Mandarin Oriental, Boston and New York, for example, upon arrival, Young Fans are presented with Mini MO, a gorgeous panda soft toy, while items such as children's menus, mini bathrobes, rubber ducks, DVDs and consoles are all available to keep families entertained and comfortable. Across the Atlantic, Mandarin Oriental Hyde Park, London makes the perfect base from which to discover the iconic city that is featured in so many children's books and movies (Paddington, Mary Poppins and Peter Pan, to name but a few). As well as a choice of in-room facilities (from cots to bath toys), the hotel also arranges seasonal events such as Easter egg hunts and Build your own gingerbread house at Christmas, while the concierge team will be pleased to pinpoint the best family-friendly activities that London has to offer. From walks, boating and horse riding in nearby Hyde Park to sightseeing (Buckingham Palace is just around the corner) and trips to attractions such as the London Eye and the Warner Bros. Studio Tour (to see how Harry Potter was made), there's always something to do in and around the UK capital. 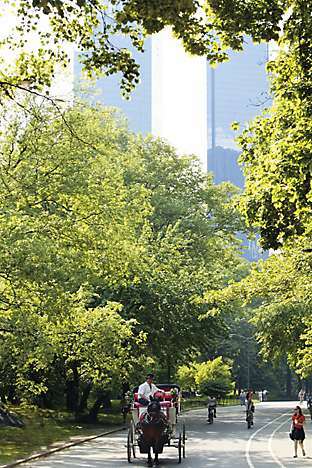 Central Park, near Mandarin Oriental, New York. Like London, Hong Kong is a great city for children to explore; they can enjoy the junks in the harbour, Disneyland and the beach. Mandarin Oriental, Hong Kong offers the perfect base for your family holiday. As well as a plush bathrobe and slippers, Young Fans visiting the hotel receive goodies such as an inspiring craft box to keep them occupied during their stay. The Suite Family Affair package includes a complimentary room for the children, welcome amenities (with champagne for parents), breakfast in the Clipper Lounge with special menus, activity packs and colouring pencils, and late checkout. Paris is another family-oriented city, and, at Mandarin Oriental, Paris, children are catered for in a typically chic way. After receiving a gift upon arrival, Young Fans will discover a popcorn machine and DVDs in their room, while the even luckier ones enjoying a long stay will receive a surprise every day. Add to this the chance to take part in special events such as Easter egg hunts, drawing workshops and Christmas activities, and you'll have some very content children on your hands. It is, however, the hotel's collaboration with Paul Smith Junior that will please style-savvy parents. As part of its Family Travel by Paul Smith Junior package, children aged one to seven are given pyjamas designed by the famous British fashion brand, while there's an alternative gift for older children. With a designated Kids' Ambassador and Kids' Concierge on hand to help with all your questions, you have a city stay made in family heaven. Another European hotspot is the contemporary Mandarin Oriental, Barcelona, which is not only spectacularly designed, but also home to an amazing spa and great restaurants. Located in the heart of the Catalan capital, the hotel welcomes families with open arms, arranging bicycle hire and kids' amenities, and offering a rooftop pool for paddling. 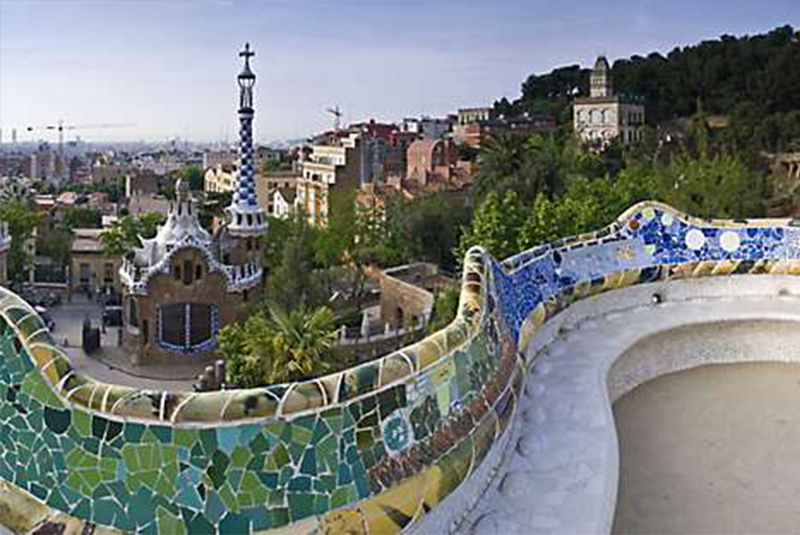 Children will enjoy the enchanting sight of Gaudí's Park Güell in Barcelona. Across the globe, the equally stylish Mandarin Oriental, Tokyo has views and modern facilities that will wow all the family. As part of the welcome, children are given super-cute mini yukatas (lightweight kimonos) and bathrobes, which are almost reason enough alone to visit. Of course, if you are heading to a tropical destination like Taipei or Singapore, you'll be thinking about how to keep cool in the heat. Mandarin Oriental, Taipei and Mandarin Oriental, Singapore boast spectacular pools. At the latter, there are panoramic views and an entertaining children's bubble-jet pool. Families can relax in a poolside cabana as a respite from the sun and order from the children's menu before jumping back into the water to enjoy swimming surrounded by the city's skyscrapers. On Sundays between 12 and 3pm, Mandarin Oriental, Singapore also arranges a Little Fan Land playroom, comprising a children's buffet, cartoon screenings, colouring and storytelling, allowing parents to escape to the hotel's popular Champagne Brunch at Melt restaurant. 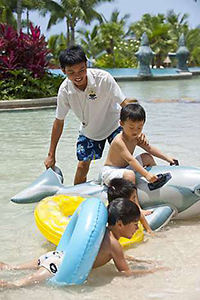 The concierge can suggest an array of options for the family away from the hotel, including visits to Universal Studios Singapore, the city's Science Centre and the amazing Gardens by the Bay, which, with its Cloud Forest and Flower Dome, is spread over three waterfront gardens and puts on programmes for all ages. At Mandarin Oriental, Tokyo, kids get cute mini kimonos—reason alone to visit. Mandarin Oriental, Miami's MoMo monkey mascot. Another warm city and a brilliant place for children, Miami has it all when it comes to family fun. From Everglades boat tours and visits to the Seaquarium to shopping, spa time and exploring the fabulous Art Deco district, Florida's most famous city has something for everyone. As stylish as the city it's in, Mandarin Oriental, Miami also ticks all the boxes for keeping kids and parents content. The Oasis Beach Club is home to a stunning infinity-edge swimming pool, a private white sand beach and a playground—its Beach Butler can provide inflatable toys and sand buckets for children, and snacks and drinks for adults—making it the perfect place to spend the day. And to give children a special memory to take away, the hotel (just like Mandarin Oriental, Atlanta) has created a scavenger hunt throughout the property for children to complete with the help of their personal "passport". Supervised fun in the leisure pool with the Kids' Club at Mandarin Oriental, Sanya. A resort is an obvious place for a family holiday, and Mandarin Oriental, Sanya on the island of Hainan has pulled out all the stops by creating the most comprehensive range of family-friendly activities in the region. Upon arrival, children receive their very own resort passport, which is full of activity ideas, such as searching for wildlife, to encourage a fun time while learning about the environment. Also available are nutritious children's menus, toys and games, and use of a brilliant pirate-themed playground. 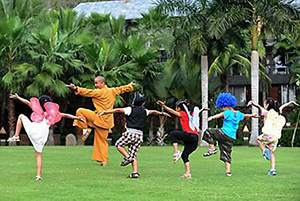 The resort's CoCo Kids' Camp is for four- to 12-year-olds, but adults will be green with envy at all the leisure pursuits on offer. From paddleboarding around Coral Bay to snorkel trips and treasure hunts, there's plenty to keep young guests busy, while the outdoor kids' movie nights provide a great way to wind down after a fun-filled day. In 2015, Mandarin Oriental, Marrakech, another fabulous family-friendly resort in a fascinating location, opened its opulent doors, promising a breathtaking experience for guests of every age. The resort's spacious villas and suites are perfect for families, with some of them boasting private plunge pools and outside areas for relaxing. In many ways, Mandarin Oriental, Bangkok is also a resort, albeit an urban one. It has a unique riverside situation and extensive facilities. With supervised fun for children aged three to 14 years, the Sanook Sanook Kids' Club is perfect. As well as craft-based activites such as coral-painting and necklace-making, children can learn about Thai culture, play board games, or enjoy some quiet time watching a film or reading a book. Tennis coaching, cookery classes (aged 15 and up) and yoga lessons are also on offer. Add to this the two swimming pools, children's menus and the countless attractions of Thailand's capital city, and you have a great family destination. 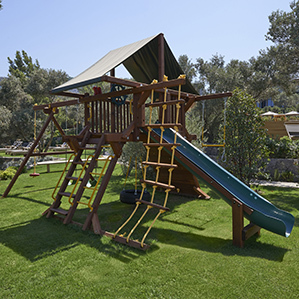 A play area at Mandarin Oriental, Bodrum. So with the children occupied and happy, parents have the chance to relax. Many of the hotels are home to award-winning spas (some, as at Mandarin Oriental, Miami, offer teen-friendly treatments) and pools, while all of them have fantastic restaurants, bars and relaxation areas where you can curl up with a cocktail or a book. Mandarin Oriental hotels can also arrange babysitting with prior notice. After taking time out to recharge your batteries, you can rejoin your family to experience the hotel and destination together, which, if you're staying at Mandarin Oriental, Las Vegas, includes a scrumptious Children's Afternoon Tea. Now, that really is the perfect family treat.